Teacher: 'I Was Fired For Refusing to Give Partial Credit"
As a parent, I fully believe that my child’s education is my responsibility. However, I personally fulfill some of that responsibility by sending my children to school. To that end, teachers and principals and school staff are my partners in my child’s education. Unfortunately, during the past couple of years I’ve been frustrated by the new education standards set by our government. 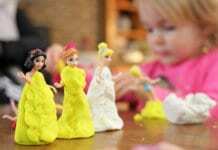 I firmly believe that they now expect too much, too soon from our kids. 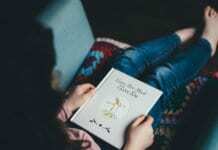 For instance, my youngest is in second grade, and the version of second grade he is in is much more difficult than the version of second grade my daughter was in just four years ago at the same school. Ugggghhh. It’s not the teacher’s fault, it’s the state tests—the state test requirements that the teachers are forced to teach in preparation for. 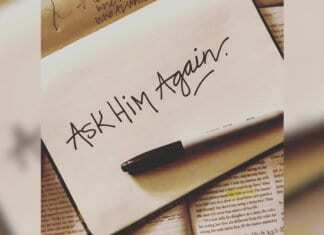 But anyway. That’s an article I’ve already written. Today, I read a news story that seems contradictory when it comes to the age-inappropriate standards that I feel students are forced to be prepared for in today’s schools. It’s about a school who had a teacher fired because she refused to give her students partial credit on an assignment that they did not hand in. WPTV reports that the Port Saint Lucie, Florida school has a “no zero policy,” but that eighth grade teacher Diane Tirado refused to give her students a 50% when they failed to hand in a notebook project she had assigned. She gave them zeros instead. Tirado has been teaching for many years, but this was her first year at this particular school. Therefore, because she was still in her probationary period, she could be fired without the school listing the cause. However, Tirado says she knows full well what the cause was. 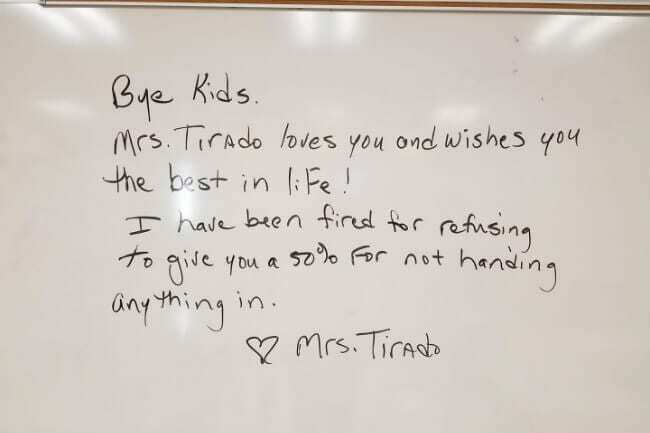 That’s why she wrote the goodbye message pictured above on her whiteboard: “Bye Kids, Mrs. Tirado loves you and wishes you the best in life! I have been fired for refusing to give you a 50% for not handing anything in. 💓 Mrs. Tirado”. Tirado also posted a photo of her message on her Facebook page, where it has received over 2600 shares. Given what I’ve noticed in my own kids’ school regarding the curriculum being too hard for the age at which it is assigned, this Florida school’s policy of giving kids a full half credit for not turning anything in just seems crazy to me. In truth, it’s crazy regardless. How are we supposed to teach our kids responsibility and work ethic if they get 50% credit at school for not even doing a thing? That’s something fired teacher Tirado is wondering as well. “Some classroom teachers and school faculties have discussed the range of points for work submitted in each grading category. 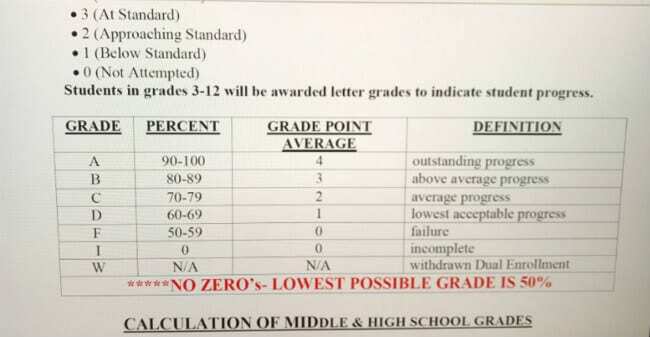 So, was this teacher fired for violating a “no zeros” policy that doesn’t actually exist? We will probably never know, since she was still in her probationary period and the school did not have to give a cause for her dismissal. Perhaps there was another, more legitimate reason for Tirado’s firing. I truly don’t know the reason, but what I DO know is that any school having a “no zeros” policy is wrong, and only teaches our kids that their negative actions don’t have real consequences. What do you think about a “no zeros” policy? Do you believe there’s more to the story here? Previous article21 Marriage Memes That Are So Relatable, It Hurts!